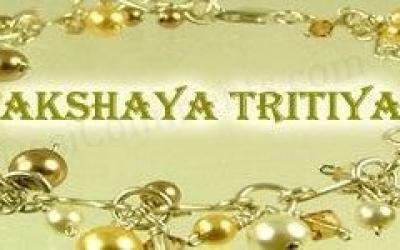 Akshaya Tritiya is one of the sacred three and a half or sade teen Muhurats as per Hindu religion. The sade teen Mahurats or auspicious timing signifies a lot of importance in Hindu religion. There are two kinds of Mahurats fixed Mahurats coming in particular months of the year and other Mahurats which are spread throughout the year. This Mahurat or Muhurta is supposed to be the right time to begin new ventures and buy precious things. It is a firm belief that any meaningful activity started on this day would be fruitful. Akshaya Tritiya falls on the third day of the bright half of Vaishakh as per Hindu calendar which is normally in the month April or May, when the Sun and Moon are in exaltation. As per the Hindu belief, Thretha Yuga was started on this day. Also the birthday of Lord Parasurama the sixth incarantion of Lord Sri Maha Vishnu is observed on the day of Akshaya Tritiya, This year’s Akshaya Tritiya or Akha Teej 2012 is coming on Tuesday 24th April. The word "Akshaya" means eternal or imperishable one which never perishes or diminishes. It is believed that doing good deeds like helping the poor, donating money etc on this day brings ‘Punya’ for life time. Other ways of celebrating Akshay Tritiya includes bathing in holy rivers, conducting special Poojas and offering prayers in the Vishnu temples. Lakshmi Kubera homa (religious offering) done on this day is supposed to bring life long prosperity. Akshaya Tritiya is believed to bring good luck and success. Most people purchase Gold on this day as it is believed that buying Gold on this day brings prosperity and more wealth in future. So it is a custom to buy valuables like gold, silver, diamonds or precious stones and property on this auspicious day. The day is also thought to be good for arranging weddings, beginning new business ventures and even going for long journeys. People born on this day are believed to be brilliant and are supposed to shine in their life for doing some extra ordinary things. Some of the great people born on Akshay Tritiya are Adi Shankaracharya, Swami Chinmayananda and Lord Buddha. In Maharashtra on this particular day crowd is observed at the gold shops for purchasing gold. In recent years since gold has reached a record high value it is becoming difficult for the common man to purchase gold. Then also to keep the trend intact people are buying whatever minimum fraction of gold they can buy. If you are not able to buy gold buy something valuable on this day of Akshaya Tritiya. 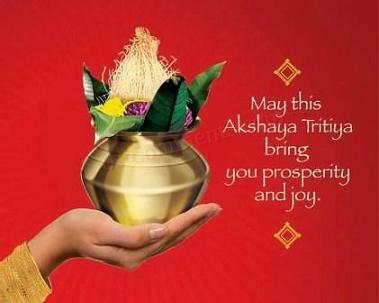 On the coming auspicious day of Akshay Tritiya you can buy something which will prove to be valuable to your family or relatives still not hurting your pocket. Buy Magic holidays a valuable gift to your dear ones which is in the reach of average man with benefits lasting for a longer period. The essence of benefits of this vacation package called Magic Holidays will last for years to come.